Solid painted wood Rhinos. 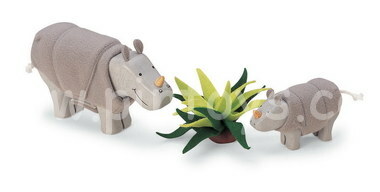 Mother and baby Rhino , solid painted wood with easily detached fur, velcroe joined. Adult Rhino 11cmH , Baby Rhino 5cmH . Includes plant. A great addition to our Wildlife Park Collection.